You decided to travel to Greece for your holidays. So, you started asking friends for information, reading guide books, browsing the Internet and you ended up with tons of information about Greece. What you need now is the expertise of a travel agent to put a feasible itinerary together. Here below you will find some itineraries that we put together based on our experience and on their feasibility and smoothness. In any case, these itineraries through Greece (mainland and islands) can be at least used as a starting point, based on which we could work together on your dream vacations in Greece. For the same purpose, as a guide-line, you could also use the vacation package deals that we have prepared. The Greek Islands ! It's time to be lazy for a while! There is ample sunshine, endless stretches of sandy beaches, azure seas and great entertainment opportunities! The following journeys are also ideal for honeymooners. A honeymoon in Greece and the Greek Islands is a very personal matter, closely related to one's perception of the perfect trip and one's aesthetics. There are more than 100 Greek Islands to choose from but the following ones offer a very romantic setting, the required standard of tourist facilities and can be smoothly combined throughout most of the tourist season! At last you have arrived in Athens. Your holidays can now begin. As you may feel jet-lagged or have a late arrival, we propose leaving the day open. Get some rest, sightsee a bit on your own, get your whereabouts and try to adjust your biological clock. Time to get officially acquainted with Athens, this vibrant historical city. 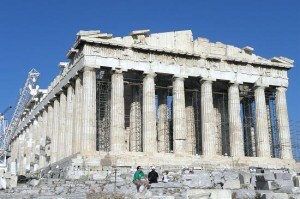 A half day Sightseeing of Athens, led by expert guides is an ideal, concise introduction. 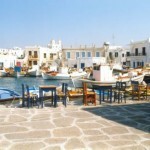 It is time to hit the islands; in the early afternoon, catch a ferry / catamaran / plane to Mykonos (6hrs / 3hrs / 50 min). 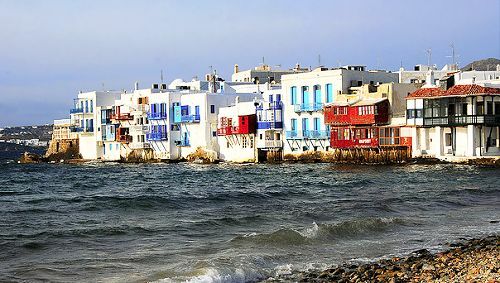 Mykonos is a unique blend of the cosmopolitan with the typical Greek. 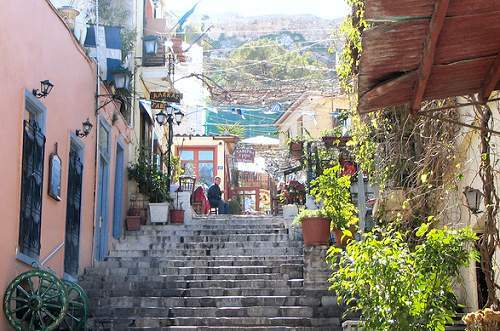 In its beautiful, scenic, dazzling whitewashed villages one finds international fashion brands alongside souvenir shops, charming tavernas and Michelin-star restaurants, nightclubs and bars next to authentic kafeneia (Greek coffee shops), exceptional hotels and dollish B&B's. The island is blessed with beautiful, sandy beaches and is the gateway to one of the most important historical sites of the country, the sacred island of the antiquity, Delos. The next destination is probably the most popular in Greece and one of the 10 most popular destinations worldwide, especially for honeymooners: Santorini. The two islands have a very regular connection by high speed boat (approx. 3 hrs). It is a bit ironical that the island of Santorini owes its spectacular landscape and captivating vistas to an active volcano. The black and red volcanic soil makes a dramatic contrast with the white and pastel colored buildings and the chapels with the blue domes. 400m above sea level, the villages are perched on the cliffs like seagulls, looking out to the volcano in the middle of the sunken Caldera. Awe-inspiring sunsets have made the island a magnet not only for honeymooners and romantic souls but also for all who crave for breathtaking natural beauty. 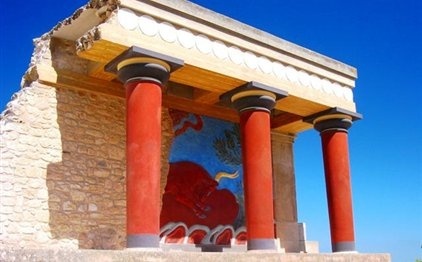 The island is also renowned for the excavation site of Akrotiri, the Greek Pompeii, one of the most important prehistoric settlements of the Aegean. 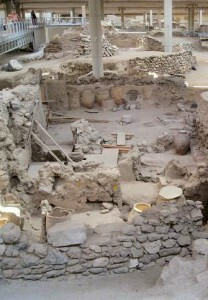 Many of the unique finds are housed in the Museum of Prehistoric Thera. The volcanic activity that has caused so much destruction in the past has given the island a very fertile soil that boasts of an internationally acknowledged wine produce as well as several agricultural products such as capers, delicious cherry tomatoes and white aubergines. Time to return to Athens. If you are in a hurry, you better fly (55 min). Otherwise, you can travel by high speed boat (5-6hrs) or take the slow boat back (8+ hrs). The capital deserves the extra time. 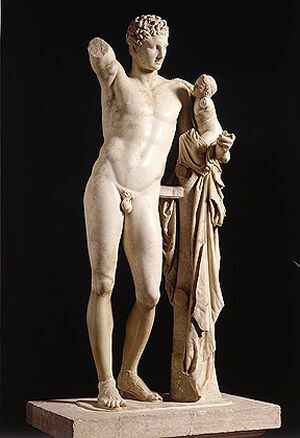 There are some really important museums, like the National Archaeological Museum or the wonderful Benaki Museum, the top private collection in the country. The city also offers excellent shopping opportunities and great culinary options. If you have extra days you can add them either to Athens or to one of the islands. You can also rearrange the days according to your likes. "Welcome to Athens", your holidays have now officially begun. Get some rest, sightsee a bit on your own, get your whereabouts and try to adjust your biological clock. 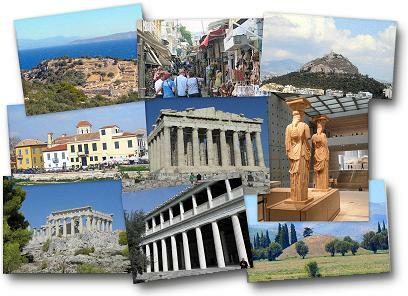 Athens for Beginners 1001: a comprehensive half day Sightseeing tour of Athens led by an expert guide, is an ideal introduction. If only you had more time but now it is time to set for the islands. 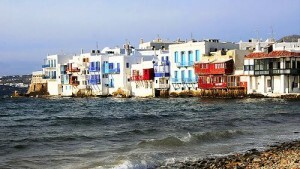 In the early afternoon, catch a ferry / catamaran / plane to Mykonos (6hrs / 3hrs / 50 min). 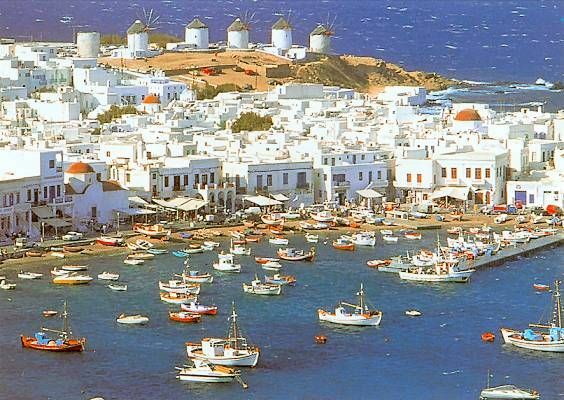 Mykonos has it all: in its beautiful, scenic, dazzling whitewashed villages one finds international fashion brands alongside souvenir shops, charming tavernas and Michelin-star restaurants, nightclubs and bars next to authentic kafeneia (Greek coffee shops), exceptional hotels and dollish B&B's. The island is blessed with beautiful, sandy beaches and is the gateway to one of the most important historical sites of the country, the sacred island of Delos. High speed boat to Paros or Naxos (40 min. 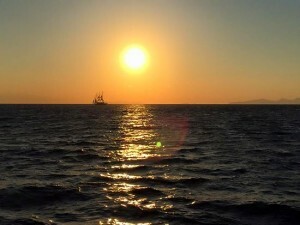 to Paros & 1 hour to Naxos). Standing between Mykonos and Santorini, these gems offer two contrasting images of the Cyclades. 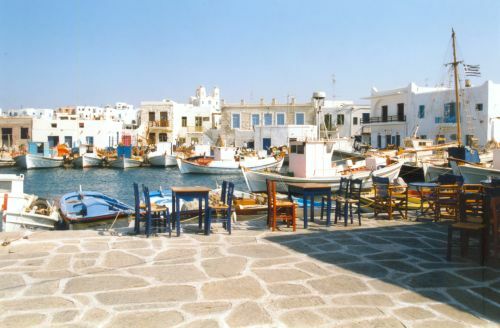 Paros is dry and rocky, with spectacular beaches with wind-sculptured rock formations; Naxos is fertile, with noteworthy agricultural produce (olives, grapes, figs, citrus fruit, corn and potatoes). 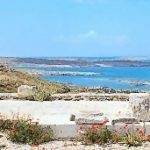 Paros thrived thanks to its quarries, from where marble of outstanding translucence was drawn and used to create masterpieces like the Venus of Milos. Naxos was a cultural centre of classical Greece and of Byzantium, while Venetian and Frankish influences have also left their mark. Both Paros and Naxos are a short ferry / high speed boat ride from Santorini (3hrs from Paros, 2 hours from Naxos, about half the time by high speed). Santorini is probably the most popular destination in Greece and one of the 10 most popular destinations worldwide, especially for romantics. Thanks to its active volcano, the island has a spectacular landscape of breathtaking beauty, an archaeological site of paramount historical importance, the excavation site of Akrotiri, and a very fertile soil that boasts of an internationally acknowledged wine produce as well as several agricultural products such as capers, delicious cherry tomatoes and white aubergines. If you also add the charming villages that are perched on the cliffs and the glorious sunsets, you have a hard to match combination. Return to Athens by plane (55min.). Overnight in Athens. It's a pity this trip must come to an end but you will definitely return! If you have extra days you can add them either to Athens or to one of the islands. 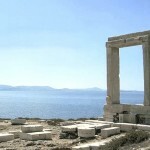 the Athens-Mykonos-Santorini-Paros & the Athens-Mykonos-Santorini-Naxos package deals. At last, you have arrived in Athens. You have a fortnight ahead to explore and learn new things, so take it easy on day one! Get some rest, sightsee a bit on your own, find your whereabouts and adjust to the different time zone. How can you fit a history of thousands of years in only a few hours? Honestly, you can't but at least this comprehensive half day sightseeing of Athens will acquaint you with periods of the city's glorious past as well as some of its dark hours. Rest of day at leisure. 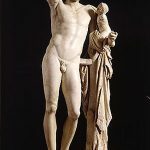 There are some exceptional museums in Athens, the National Archaeological Museum or the wonderful Benaki Museum, the top private collection in the country. 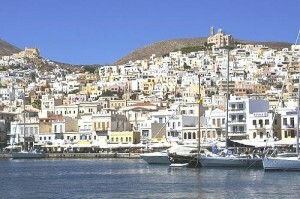 Depart for Syros (by normal or high speed ferry, 5hrs or 3hrs respectively). 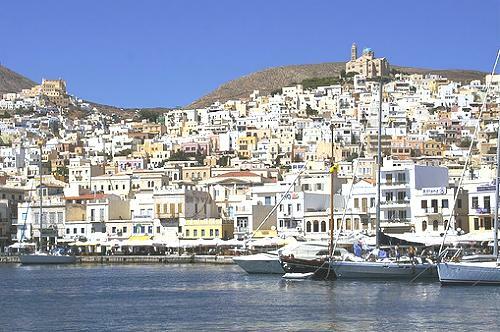 An island that relies little on tourism as it is the legal and administrative centre of the Cyclades, Syros buzzes with life year-round. 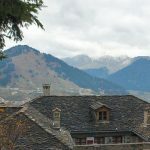 Its grand town (or chora), Ermoupolis, boasts of beautiful public buildings and mansions, designed by prominent architects of the 19th century like Ziller, Sambo and Erlacher, and comes into direct contract with the rather rural landscape beyond the town borders. Not far from Syros, lies Tinos (ferry / high speed, 1hour / 30min). The island is mainly known for the sacred Greek Orthodox pilgrimage site, the Church of Panagia Evangelistria, in the main town. Consecrated to the Virgin Mary, the interior of the church is covered with votive offerings: small silver and gold plates engraved with eyes, legs, hands, ships, houses, each one a prayer for good health, safe return of loved ones, good fortune. But there is more to the island than just the church. There are dozens of lovely villages, with charming houses with delicate marble decorations (there were marble quarries here) and ornate dovecotes, beautiful bays for swimming and great food made of the local produce. Time to pump up the volume! In less than 40 minutes (by normal ferry / 20 minutes by high speed), you will be in Mykonos. What a unique blend of the cosmopolitan with the typical Greek. 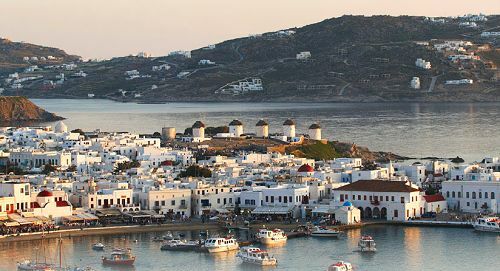 In its beautiful, scenic, dazzling whitewashed villages one finds international fashion brands alongside souvenir shops, charming tavernas and Michelin-star restaurants, nightclubs and bars next to authentic kafeneia (Greek coffee shops), exceptional hotels and doll-like B&B's. 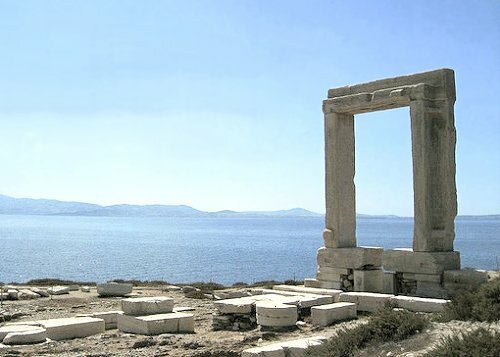 The island is blessed with beautiful, sandy beaches and is the gateway to one of the most important historical sites of the country, the sacred island of the antiquity, Delos. Time to return to Athens. If you are in a hurry, you better fly (45 min). Otherwise, you can travel by high speed boat (3-4hrs) or take the slow boat back (6+ hrs). The capital deserves the extra time. There are tours for all sorts of interests: for the classical era, the Byzantine period, the Ottoman influence, the more recent past. Tours on food, architecture and art, tours on foot, by bus, on bicycles or even segway. The city also offers excellent shopping opportunities and great culinary options. 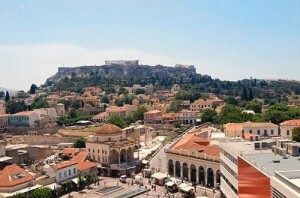 Introduction to the history of Athens. Not an easy task, when you have thousands of years on your back. This half day sightseeing tour is a good starting point. You can dedicate the rest of the day exploring further or visiting one of the great museums the city has, like the National Archaeological Museum or the wonderful Benaki Museum, the top private collection in the country. By ferry, high speed or airplane (6hrs /3hrs / 50min), you are only a few hours away from the undeniably most cosmopolitan destination of the country. Mykonos was very popular among the international jet set already in the early 70's. 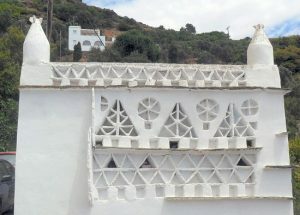 People were drawn by the whitewashed houses, the windmills standing over the town, reminiscent of the island's once prosperous agricultural economy, the crystal clear waters and the sandy beaches and the simple way of life. Nowadays one can find not only the above but also high-end boutiques, luxurious hotels, great eateries, nightlife and all sorts of activities. The next destination is Santorini; the two islands have a very regular connection by high speed boat (approx. 3 hrs). Santorini is probably the most popular in Greece and one of the 10 most popular destinations worldwide, especially for honeymooners. The island owes its spectacular landscape and captivating vistas to an active volcano. The black and red volcanic soil makes a dramatic contrast with the white and pastel colored buildings and the chapels with the blue domes, all perched 400m above sea level, like flocks of seagulls. Awe-inspiring sunsets have made the island a magnet not only for honeymooners and romantic souls but also for all who crave for breathtaking natural beauty. High speed boat to Crete (Heraklion town - 2 hrs). This island is so rich in all aspects - culture, landscape, history, gastronomy - that one could easily dedicate the entire fortnight exploring it and still depart with a feeling of not having seen enough. The 4 days allocated in this program offer only a bird's view. Minoan palaces, Byzantine churches, Ottoman mosques, Venetian fortresses, lush gorges, sun-drenched beaches and more, blend in harmoniously. On top of it all: a second to none local cuisine, the pride of the Mediterranean culinary tradition, that will be carved in your memory for ever. Return by plane to Athens (1 hour). Depending on the time of your return, you may have time for a little more sightseeing in Athens or some souvenir shopping. It is always sad to leave but there is always the promise to return. If you have extra days you can add them either to Athens or to one of the islands. You can re-balance the itinerary according to where you place more importance. We don't recommend spending less than 4 days on Crete due to the size of the island. The order can be readjusted to achieve maximum time efficiency. 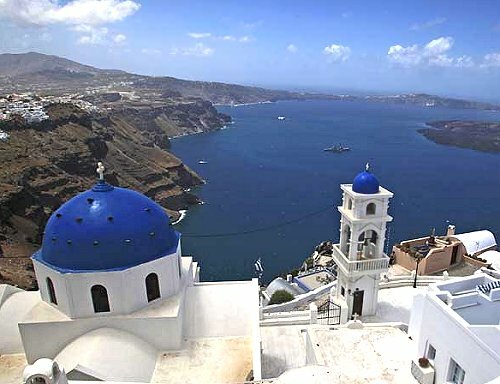 For pricing information you may check the Athens-Mykonos-Santorini-Crete package deal. You've made it to Athens, hurray! Time to get some rest, sightsee a bit on your own, get your whereabouts and try to adjust your biological clock. We cannot cover the whole of the Athenian history in 5hrs but this half-day city tour is a good introduction. After the tour is concluded, you can explore further on your own, visiting some exceptional museums in Athens, like the National Archaeological Museum or the wonderful Benaki Museum, the top private collection in the country. You love to travel but you want to do it comfortably. Packing and unpacking every other day is not your thing. Here is the solution: join a 4-day cruise (always sailing on a Monday). 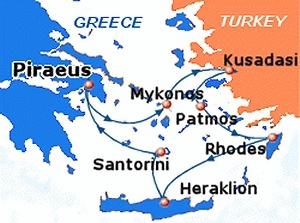 The cruise includes top of the line destinations like Mykonos, Patmos, Rhodes and Crete. At each port of call, different tour options are available; tours that will acquaint you with the history of each area. Early morning arrival in Athens. You are now on stable ground, yet we propose embarking again, this time on a Greek mainland adventure, done either privately (by renting a car or hiring a professional driver) or by joining a multiple-days organized bus tour. The tours usually return to Athens in the early afternoon. Leisure time to get ready for your trip back home and to let the volume of images and information settle inside your head. Ready to go. Bags are packed and thank God, experiences, images and knowledge don't get weighed at the airport! If you have time, you can add 1-2 extra days either to the mainland portion or to the islands by disembarking at the last island and then return to Athens by your own means. Visiting Greece by car can bring that extra independence and freedom which makes it all the more fun. In a week, or better still, two, you can get really close to the countryside and the people. 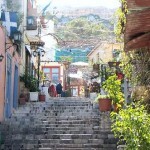 Here below follow some suggested itineraries of the Greek mainland - also called Fly & Drive trips. 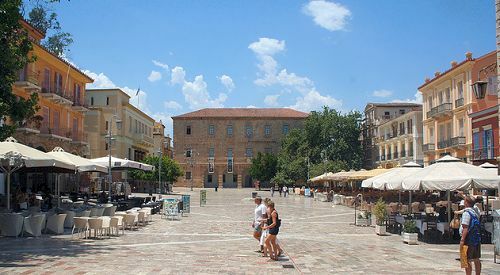 They are all based on the assumption that the trip starts and ends in Athens but, needless to say, we can put together programs that begin and end at other airports, like Thessaloniki or Kalamata. Most can be organized on a private, self-driving basis. For those who are worried about driving around Greece, we can offer excellent drivers who will do the "hard work" while you enjoy! 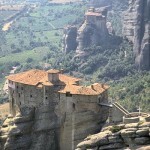 In the morning, have the car delivered to the hotel in Athens, and drive to Meteora (about 6 hours). Visit the monasteries. 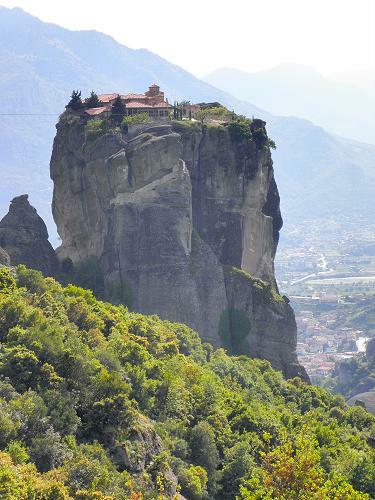 Morning in the Meteora to complete your visit to the monasteries. In the early afternoon depart for Delphi (about 4-5 hours). 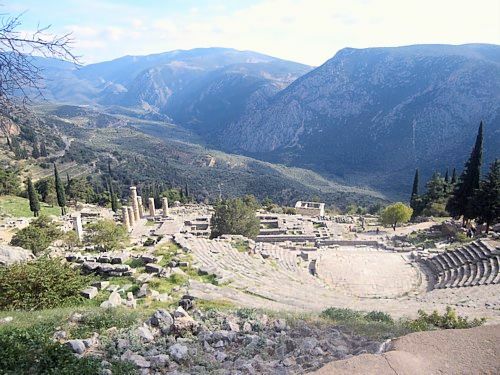 All day in Delphi and visit of the archaeological site and the museum. Overnight. In the morning, drive to Olympia (either over the Rio bridge or 15' ferry crossing). Total about 5 hours. 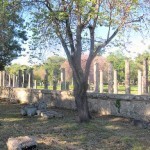 Sightseeing in the archaeological site of Olympia. Early afternoon drive to Nafplion (4-5 hours, difficult drive). In Nauplion. 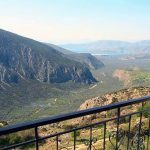 Possible visits to the sites of Mycenae, Tyrins, Epidauros. Drive to Athens. On the way you may visit Corinth. 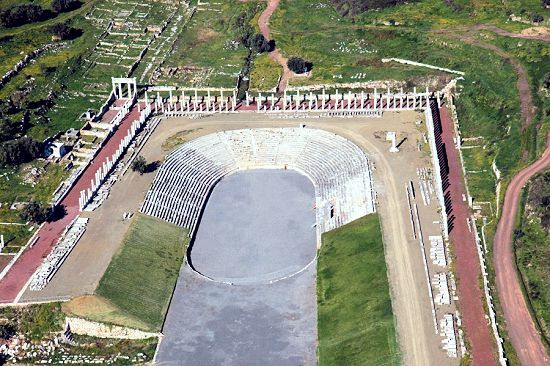 On the 6th day, you could also watch a performance of ancient drama in the theatre of Epidavros. Flight from Athens to Ioannina (1 hour). Collect a rented car at the airport of Ioannina. Explore the city. Drive to Zagorochoria like Mikro Papingo or Megalo Papingo (small and big respectively). 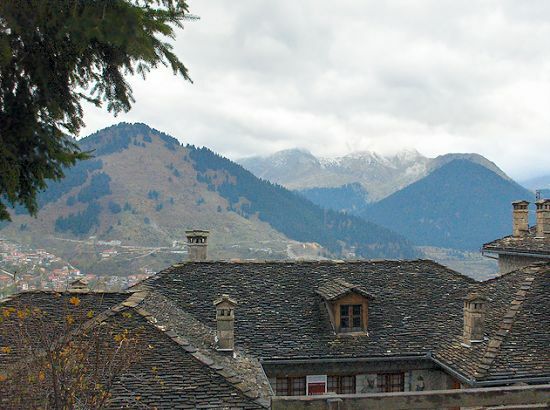 Continue to Kalambaka, making a stop on the way to Metsovo, one of the most picturesque villages in this area. 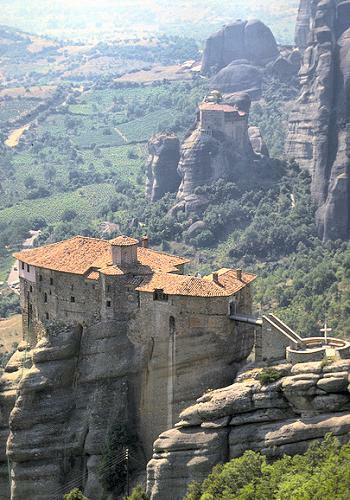 Overnight in Kalambaka, the town closest to Meteora. 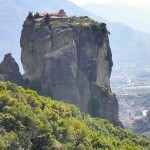 In the morning visit the monasteries of Meteora. 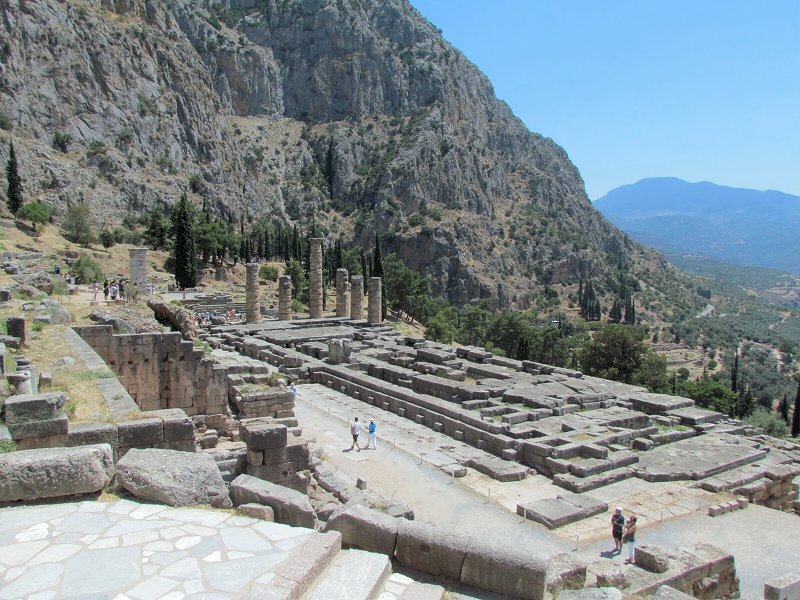 Leave in the early afternoon for Delphi (approx. 4.5hrs). Depending on the time of the arrival, you may have time to visit either the site or the oracle. There is also the museum with the famous bronze statue of the charioteer. 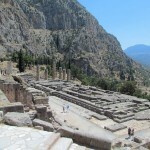 Complete the visit of Delphi. Drive through Antirio/Rio to Kalavryta (approx. 3hrs). In the morning, you can visit the Monastery of Agia Lavra, where, according to tradition, the revolution against the Turks started. You can also go up on Lousios river and hike the gorge, if possible. 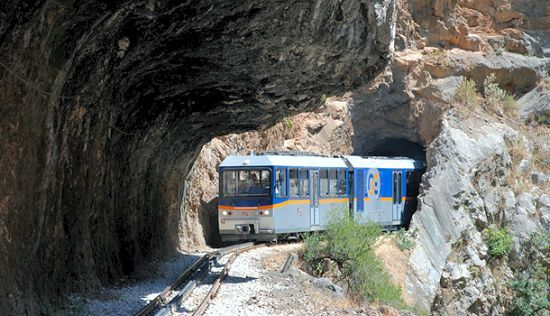 Another option is to take the rack railway to Diakofto and back, a most beautiful route that is partly in the gorge. Overnight: you can either return to Athens (approx. 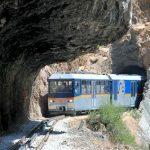 3 hrs) or stay overnight in Kalavryta. Return to Athens. On the way you may visit Corinth. Collect your car at the hotel. 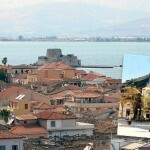 Drive from Athens to Nafplion, the first capital of liberated Greece. It is a very picturesque town, with beautiful old houses. 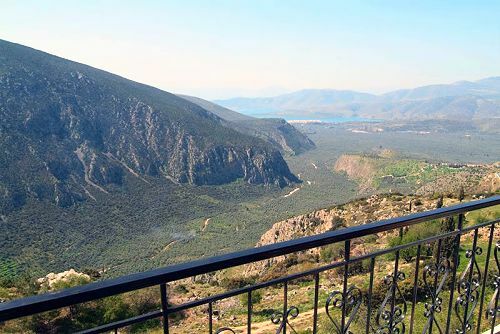 From here you can visit Mycenae and Epidaurus. Drive to Sparta (approx. 2hrs). 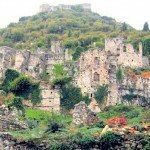 Visit Mystras, the medieval town with the important Byzantine churches. 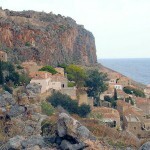 Continue to Monemvasia (approx. 2 hrs). 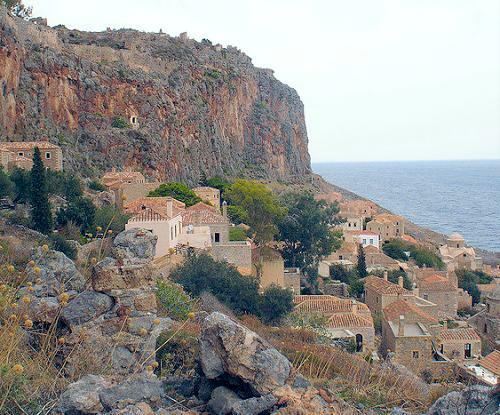 Drive from Monemvasia to Mani peninsula, a ragged terrain with a very long history. Visit the caves in Diros, a true masterpiece of nature. 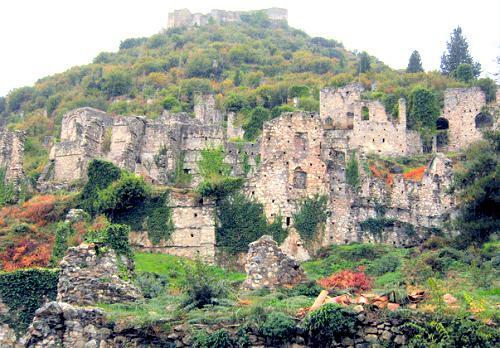 Continue to the village of Vathia, a totally preserved medieval town with old castle-houses. Overnight in one of the villages of Mani. Drive along the coast to Kalamata. This coast line is full of pretty villages and is very green. Continue towards Messini - also a very important site - and then finally to Vassai (total driving time without stop at Messini, 4hrs). 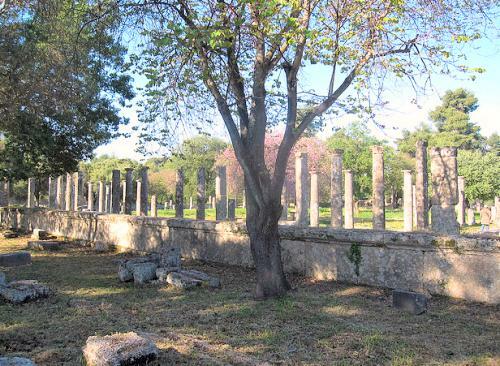 In Vassai one can visit the Temple of Epicourios Apollon, one of the best preserved temples in Greece, designed by Iktinos (architect of the Acropolis). It is under the protection of UNESCO. Overnight in Olympia (about 1 hour). 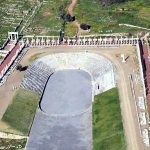 Visit the birthplace of the Olympic Games (site/museum). 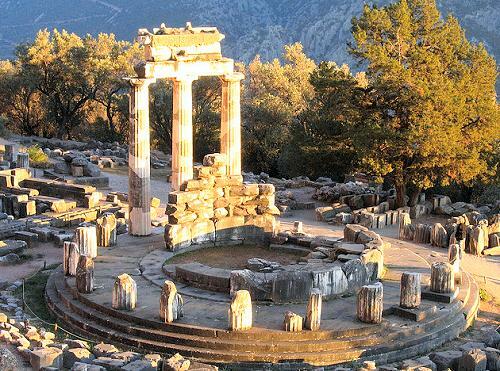 Drive to Delphi via Rio/Antirio; the driving distance between Olympia and Delphi is about 4-4,5hrs. Overnight in the town of Delphi. 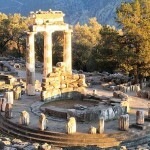 Visit the archaeological site of Delphi and the museum.